Baroque chamber pop darling Meilyr Jones has won this year’s Welsh Music Prize, Getintothis’ Cath Bore celebrates and muses on the future role of music prizes. Music prizes, like the end of year lists shortly to swamp every music publication, blog and website, are always contentious. You can’t please everyone, that is true, but it seems more the case now they satisfy fewer than ever before. The Mercury Music Prize this past September reached the point of no redemption. When national-treasure-in-waiting Jarvis Cocker raised his eyes to heaven at the ceremony and intoned, with absolutely no sodding irony whatsoever, “it’s what David Bowie would have wanted” before announcing the winner Skepta, I strongly suspected the Mercury had reached a level of condescension even the most cynical observer – me, in other words – could ever have imagined. I’m not sure what happened to the Jarvis who wiggled his bottom at Michael Jackson when he played up at awards ceremonies, but can please can someone to do the same to him? It is the only way he will learn. That would be irony; and ironically again, the Pulp sort. Skepta was a good choice from what was on offer, but the bigger music awards have lost it. The BRIT Awards are pure puff and fluff, no news there. The Mercury Music Prize costs £190 + VAT – that’s £228 in real money – to enter, so throwing a hat in the ring doesn’t come cheap. The UK music industry enters approximately 250 albums per year to the competition, a tiny percentage of what’s out there. It doesn’t go near to full and adequate representation of what we listen to, and fall in love with, throughout the year. And so, our attentions are drawn to the regional awards, the canniest and smartest of all, snapping up the tastiest of new and interesting music, and championing it. Smaller prizes are more relevant now than ever before. 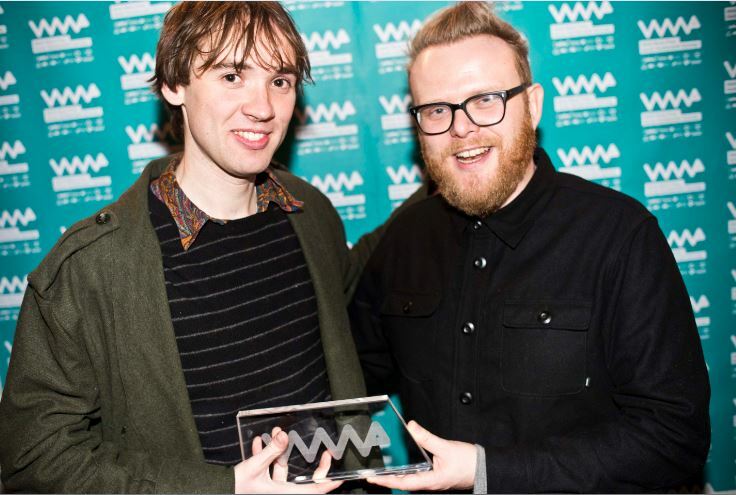 On Thursday evening the winner of the Welsh Music Prize, founded in 2011 by BBC Radio 1 DJ Huw Stephens and music promoter John Rostron, was announced at The Depot In Cardiff. It was with some relief that the hotly tipped album 2013, by Meilyr Jones, triumphed. 2013 is an album of wonders, baroque chamber pop, romantic and deeply beautiful in the extreme. Written while he took a break in Rome after his previous band Race Horses split, Jones made the record with the help of family and friends, including Stealing Sheep’s Lucy Mercer. The responses to the album, and Meilyr Jones’ live performances in the past year and a half, have been intense and remarkable, leaving grown men in unashamed tears. Race Horses’ second album Furniture was shortlisted for the prize three years ago, but Meilyr now takes his place, as a solo artist, alongside previous winners Super Furry Animals’ Gruff Rhys, Future of the Left, Georgia Ruth, Joanna Gruesome, and Gwenno. His new single, a band version recording of the orchestral Return to Life from the album, was released last week. He’s also been chosen for SXSW in March 2017, so the future holds even more promise. The Welsh Music Prize shortlist this year was a strong one, a mixture of Welsh and English language albums. Nominees included Cate le Bon’s tremendous Crab Day, Tir a Golau by alt-folk siblings Plu (who double up as three quarters of Bendith, surely contenders for the Prize in 2017), The Anchoress’ much lauded Confessions of a Romance Novelist, Simon Love’s It Seemed Like a Good Idea at the Time, and Jones’ old Race Horses bandmate Alun Gaffey’s eponymously titled debut album. The Scottish Album of The Year, revealed back in June, was won by Anna Meredith who headed a robust roll call of Scottish talent, including Chvrches, Steve Mason, and C Duncan. Composer and producer Meredith, brought up in Edinburgh, emerged from the classical world with the truly remarkable mainstream release, Varmints. And we here in Liverpool and Wirral are very much in a golden age of new music right now, so much so that there’s a worry that substantial talent might be left behind to slip through tastemaker cracks, hence the importance of our own GIT Award, celebrating Merseyside music since 2012. The thing is, the big boys have given up even pretending they are offering everyone a fair crack of the whip. The NME’s choice of The 1975’s I Like It When You Sleep, For You Are So Beautiful Yet So Unaware Of It, for album of the year is just silly nonsense. That’s taking the piss out of us, without shame. Let’s hope more sensible end of the year lists at least look more kindly on innovative artists , the ones who scoop these regional awards, and fresh talent from the sometimes hidden corners of the UK. It’s the right thing to do. And it’s what David would have wanted. It really is.